What is the difference between hydrosols and essential oils? When do I use essential oils, and when do I use hydrosols? What is the shelf life of hydrosols? How do I know when hydrosols are going bad? What are the expected pH ranges of hydrosols? How do I use hydrosols topically? How do I use hydrosols internally? What are the dilution guidelines for hydrosols? What are some recipes and usage suggestions for hydrosols? What are the therapeutic benefits of hydrosols? How do I use hydrosols with my pets? What are some resources you recommend for learning more about hydrosols? Where can I purchase hydrosols? Get these questions answered today! One of the $230 worth of products included FREE with UEOS BASICS VIP enrollment! Lea Jacobson is a Certified Clinical Aromatherapist Scholar's Program graduate from Aromahead Institute. Her website, Using Essential Oils Safely is home to educational advice and empowering information about using essential oils safely. The Using Essential Oils Safely facebook group founded and run by Lea and her team has over 165,000 members and hundreds of new members joining each week. Author of her bestseller Essential Oil Profiles (available as a full color print book as well as an ebook) is based off the information in the popular Top 60 Essential Oils APP, the print version has sold out in days each time it's been offered. 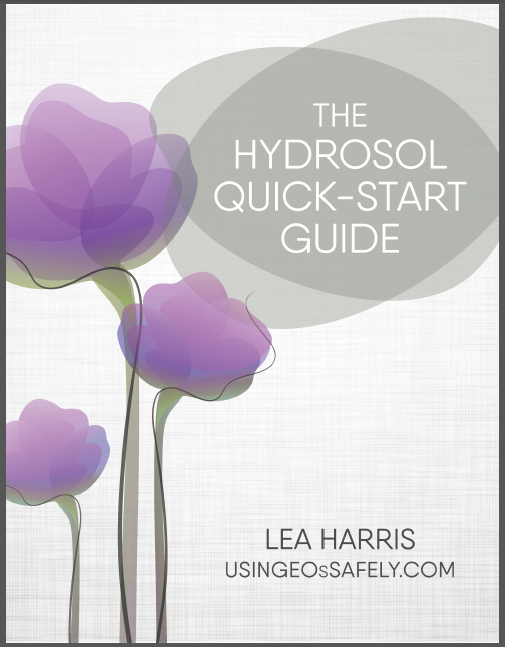 Other books by Lea: The TRUTH About Essential Oil Safety, and the Hydrosols Quick Start Guide. She is the creator of Safe Essential Oil Labels, designed to wrap around any size or brand bottle, as well as apps for essential oils and carriers, and hydrosols. You can find FREE classes here: Free Essential Oil Classes, and sign up for the Using Essential Oils Safely BASICS course Lea teaches where you can earn your "Essential Oil Safety Advocate" title. Lea is Professional level member of the Alliance of International Aromatherapists and received her herbalist certification through The Herbal Academy of New England. Businesses, groups, and individuals can hire Lea to consult on safety, product formulation, and more on her website Lea Jacobson CCA. Good description of guide, useful information for beginners. If you are new to hydrosols, this is a good place to start.